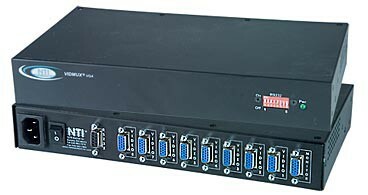 The VIDMUX® VGA video switch enables up to 16 computers to be connected to a single video monitor, projector or LCD/plasma screen. Ideal for classrooms and boardrooms. Interconnect NTI switches & splitters for complex applications. Available with audio and/or RS232 control options. Monitors and speakers are hot-pluggable. Rackmount kit included with the 4/8-port video-only models and the 4/8/16-port audio/video models. Optional rackmount case available for the 16-port video-only switch. Crisp & clear 1920x1200 resolution. SE-15V-2-2C1U: Two male and one female 15-pin HD connectors. SE-15V-2-2U1C: Two female and one male 15-pin HD connectors. 3-foot (0.91-meter) multicoax cable included. SE-15V-2-2C1U-TTL: Two male and one female 15-pin HD connectors. SE-15V-2-2U1C-TTL: Two female and one male 15-pin HD connectors. Female 9 pin D connector for remote control. Pin 2=TTL or contact closure signal. Each user can locally control and view their own computer. A remote monitor can display the output from any attached video inputs. 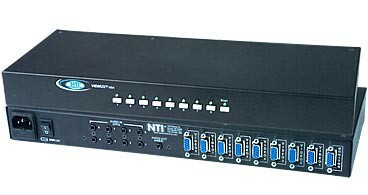 The 16-port switch is available in a rackmount enclosure. Add “-R” to Part # for Rackmounted in a 19" metal case.